The Guardians met at the workhouse on Tuesdays. The new Oughterard workhouse, for 600 inmates, occupied an eight acre site at the south-west of the town. The building cost £5,950 to construct, plus a further £1,055 for fixtures and fittings. Designed by the Poor Law Commissioners' architect George Wilkinson, the building followed a design similar to that used for other workhouses erected during this period, for example at Claremorris or Tubbercurry. At the west, facing the road, a central entrance gate was flanked by two long blocks, usually allocated to children's accommodation and schoolrooms. To the rear, a T-shaped main building contained kitchens, dining-room and chapel at the centre, with accommodation blocks for adult male and females to each side. At the rear was a separate hospital block. The former workhouse site was redeveloped in 1999-2000 as a housing estate. Oughterard Union workhouse site from the north-west, 2000. © Peter Higginbotham. 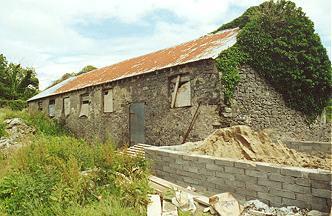 In 2000, one small structure remained at the rear of the site, possibly part of the infirmary block. 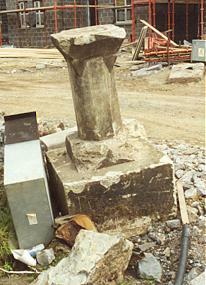 A piece of ornamental masonry, possibly from the former workhouse building, lay among the builders' debris.